ROTOCAV E-PIC S.r.l. proprietary hydrodynamic cavitator technology can be applied to reactive homogeneous and heterogeneous systems, when mass transfer is of fundamental importance for chemical reactions to proceed. Which are the advantages I can achieve by using a ROTOCAV hydrodynamic cavitator in processes where chemical reactions are involved? More into details, how the ROTOCAV hydrodynamic cavitator can improve an industrial process? 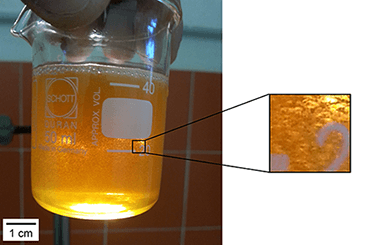 As an example, it is shown a case study related to the oxidation of vegetable oil (waste cooking oil) with air, before sulfonation/sulfation step. The oil viscosity is an index of the oil oxidation: its value increases gradually, as the reaction proceeds. 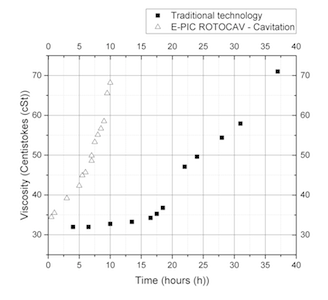 It is clear from the experimental data, reported in the following chart, that the ROTOCAV technology increases the mass transfer thanks to cavitation. The reaction is completed in about 10 hours instead of more than 30 hours of the traditional process (in which air is dispersed by a Rushton turbin). The hydrodynamic cavitation effect, induced by ROTOCAV treatment, is able to generate a stable dispersion with air micro-bubbles homogenously dispersed in the continuous oily phase. The gas-liquid surface area increases, promoting the reaction, now limited by only the chemical kinetic.